Micrograph of a seminoma, a common germ cell tumor. A germ-cell tumor (GCT) is a neoplasm derived from germ cells. Germ-cell tumors can be cancerous or benign. Germ cells normally occur inside the gonads (ovary and testis). GCTs that originate outside the gonads may be birth defects resulting from errors during development of the embryo. Some investigators suggest that this distribution arises as a consequence of abnormal migration of germ cells during embryogenesis. Others hypothesize a widespread distribution of germ cells to multiple sites during normal embryogenesis, with these cells conveying genetic information or providing regulatory functions at somatic sites. Extragonadal GCTs were thought initially to be isolated metastases from an undetected primary tumor in a gonad, but many germ cell tumors are now known to be congenital and originate outside the gonads. The most notable of these is sacrococcygeal teratoma, the single most common tumor diagnosed in babies at birth. Of all anterior mediastinal tumors, 15–20% are GCTs of which about 50% are benign teratomas. Ovarian teratomas may be associated with anti-NMDA receptor encephalitis. The germinomatous or seminomatous germ-cell tumors (GGCT, SGCT) include only germinoma and its synonyms dysgerminoma and seminoma. The nongerminomatous or nonseminomatous germ-cell tumors (NGGCT, NSGCT) include all other germ-cell tumors, pure and mixed. The two classes reflect an important clinical difference. Compared to germinomatous tumors, nongerminomatous tumors tend to grow faster, have an earlier mean age at time of diagnosis ( around 25 years versus 35 years, in the case of testicular cancers), and have a lower five-year survival rate. The survival rate for germinomatous tumors is higher in part because these tumors are very sensitive to radiation, and they also respond well to chemotherapy. The prognosis for nongerminomatous tumours has improved dramatically, however, due to the use of platinum-based chemotherapy regimens. Polyembryoma 9072/3 15–25 ? ? ? Gonadoblastoma 9073/1 ? ? ? ? Mixed germ cell tumors occur in many forms. Among these, a common form is teratoma with endodermal sinus tumor. Teratocarcinoma refers to a germ cell tumor that is a mixture of teratoma with embryonal carcinoma, or with choriocarcinoma, or with both. This kind of mixed germ cell tumor may be known simply as a teratoma with elements of embryonal carcinoma or choriocarcinoma, or simply by ignoring the teratoma component and referring only to its malignant component: embryonal carcinoma and/or choriocarcinoma. They can present in the anterior mediastinum. In females, GCTs account for 30% of ovarian tumors, but only 1 to 3% of ovarian cancers in North America. In younger women, they are more common, thus in patients under the age of 21, 60% of ovarian tumors are of the germ-cell type, and up to one-third are malignant. In males, GCTs of the testis occur typically after puberty and are malignant (testicular cancer). In neonates, infants, and children younger than 4 years, most are sacrococcygeal teratomas. Women with benign GCTs such as mature teratomas (dermoid cysts) are cured by ovarian cystectomy or oophorectomy. In general, all patients with malignant GCTs have the same staging surgery that is done for epithelial ovarian cancer. If the patient is in her reproductive years, an alternative is unilateral salpingoophorectomy, while the uterus, the ovary, and the fallopian tube on the opposite side can be left behind. This is not an option when the cancer is in both ovaries. If the patient has finished having children, the surgery involves complete staging, including salpingoophorectomy on both sides, as well as hysterectomy. Most patients with germ-cell cancer need to be treated with combination chemotherapy for at least three cycles. The chemotherapy regimen most commonly used in GCTs is called PEB (or BEP), and consists of bleomycin, etoposide, and a platinum-based antineoplastic (cisplatin). The 1997 International Germ Cell Consensus Classification is a tool for estimating the risk of relapse after treatment of malignant germ-cell tumor. A small study of ovarian tumors in girls reports a correlation between cystic and benign tumors, and conversely, solid and malignant tumors. Because the cystic extent of a tumor can be estimated by ultrasound, MRI, or CT scan before surgery, this permits selection of the most appropriate surgical plan to minimize risk of spillage of a malignant tumor. Access to appropriate treatment has a large effect on outcome. A 1993 study of outcomes in Scotland found that for 454 men with nonseminomatous (nongerminomatous) GCTs diagnosed between 1975 and 1989, five-year survival increased over time and with earlier diagnosis. Adjusting for these and other factors, survival was 60% higher for men treated in a cancer unit that treated the majority of these men, though the unit treated more men with the worst prognosis. Choriocarcinoma of the testicles has the worst prognosis of all germ-cell cancers. ^ Omata T, Kodama K, Watanabe Y, Iida Y, Furusawa Y, Takashima A, Takahashi Y, Sakuma H, Tanaka K, Fujii K, Shimojo N (May 2017). "Ovarian teratoma development after anti-NMDA receptor encephalitis treatment". Brain & Development. 39 (5): 448–451. doi:10.1016/j.braindev.2016.12.003. PMID 28040316. ^ Ulbright TM (February 2005). "Germ cell tumors of the gonads: a selective review emphasizing problems in differential diagnosis, newly appreciated, and controversial issues". Modern Pathology. 18 Suppl 2: S61–79. doi:10.1038/modpathol.3800310. PMID 15761467. ^ Robbins SL, Kumar V, Cotran RS (2003). Robbins Basic Pathology (7th ed.). Philadelphia: Saunders. p. 664. ISBN 0-7216-9274-5. ^ Nielsen OS, Munro AJ, Duncan W, Sturgeon J, Gospodarowicz MK, Jewett MA, Malkin A, Thomas GM (1990). 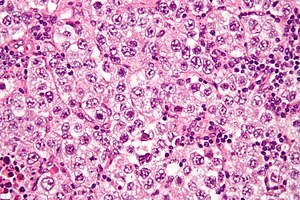 "Is placental alkaline phosphatase (PLAP) a useful marker for seminoma?". European Journal of Cancer. 26 (10): 1049–54. doi:10.1016/0277-5379(90)90049-y. PMID 2148879. ^ Bebb GG, Grannis FW, Paz IB, Slovak ML, Chilcote R (August 1998). "Mediastinal germ cell tumor in a child with precocious puberty and Klinefelter syndrome". The Annals of Thoracic Surgery. 66 (2): 547–8. doi:10.1016/S0003-4975(98)00504-9. PMID 9725401. ^ International Germ Cell Cancer Collaborative Group (February 1997). "International Germ Cell Consensus Classification: a prognostic factor-based staging system for metastatic germ cell cancers". Journal of Clinical Oncology. 15 (2): 594–603. doi:10.1200/jco.1997.15.2.594. PMID 9053482. ^ Stankovic ZB, Djukic MK, Savic D, Lukac BJ, Djuricic S, Sedlecki K, Zdravkovic D (October 2006). "Pre-operative differentiation of pediatric ovarian tumors: morphological scoring system and tumor markers". Journal of Pediatric Endocrinology & Metabolism : JPEM. 19 (10): 1231–8. doi:10.1515/JPEM.2006.19.10.1231. PMID 17172084. ^ Harding MJ, Paul J, Gillis CR, Kaye SB (April 1993). "Management of malignant teratoma: does referral to a specialist unit matter?". Lancet. 341 (8851): 999–1002. doi:10.1016/0140-6736(93)91082-W. PMID 8096954. ^ Verville KM (2009). Testicular Cancer. Infobase Publishing. p. 76. ISBN 978-1-60413-166-6. Packer RJ, Cohen BH, Cooney K, Coney K (2000). "Intracranial germ cell tumors". The Oncologist. 5 (4): 312–20. PMID 10964999. This page was last edited on 7 March 2019, at 23:28 (UTC).